But the compiler gives me compile error because there is not such myurl string in my string file yet. When project is built it will add it. I guess the values/strings.xml should be populatet with your default environment data, for example “dev”, to prevent compilation errors. When you will build against another environment, eg. : prod, the values in strings.xml will be overriten. 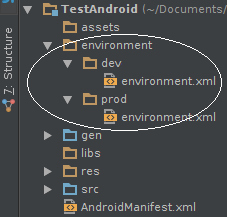 is there a gradle equivalent to this?